8th 15th 22nd November 2018. Stacks Bistro. 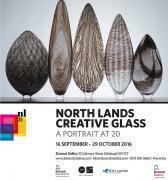 NorthalndsCreative Glass currently has an exhibition in running in Edinburgh so if you happen to be around Infirmary Street take look. Finishes 29th October 2016..
Any seed when planted needs many things in order to flourish and grow. North Lands Creative Glass was a seed sown in 1996 in the small fishing village of Lybster on the North east coast of Scotland and over the past 20 years the people and place of Lybster and Caithness have provided good fertile nourishment. Flameworking with Ian Pearson. 5-7 April and 18-20 October 2016.